The Magic 2013 Core Set features 249 black-bordered cards, including randomly inserted premium versions of all cards in the set. 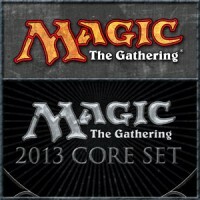 The Magic 2013 Core Set is available in booster packs, intro packs, and fat packs. Add a Review for "Magic: The Gathering – 2013 Core Set"